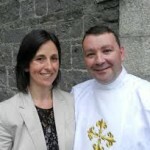 This smiling couple is Deacon Fergal and Mary O’Neill. If you’ve been with us for a while, you know of Fergal’s long-time Hunger to become a permanent deacon in the Catholic Church. He’s our guest interview on this show, and we go from his childhood to growing up, to college, to meeting lovely Mary, to bringing six children into the world. But all the while, the question was: “What else does Jesus ask of me?” That dear listeners is the Hunger to serve the Lord, His Church and His people. Thank you for your ‘yes’ Fergal. Blessings and congratulations from Tom and Dee. And our listeners, I believe most certainly. Four and a half year old MATTIE CLARE SWEENEY debuts on Catholic Vitamins reading a Gospel passage about the birth of Jesus. Can you spell S W E E T? This entry was posted in Podcasts and tagged Clergy, Deacon, Vitamin H. Bookmark the permalink.